A man cave is traditionally a place for men to get in touch with their masculine side and to escape and recharge by bonding with each other. An area free of rules or judgement from the female members of the family, men can watch sports, play video games, drink, speak their mind with their mates, or whatever else their heart desires! A man cave is more than a room to watch sport in. It should have a masculine energy and be filled with furniture, artwork, memorabilia and other items that bring joy to its male owner. It’s also a great place for wives and girlfriends to hide their partner’s treasures away from the décor of the main living areas. A full sized pool table, arcade machine or projector screen are better in a man cave then the family lounge room! 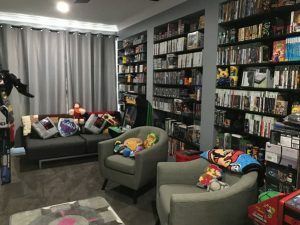 Themed around gaming, hunting, cars, sports, beer and food, or just purely being an awesome place to hang out, man caves are the ultimate personal pad! What room can you turn into a man cave? Man caves are a great use of an awkward small room if you’re looking for inspiration. If you’re stuck for ideas on how to fully utilise a small living room, bedroom or awkwardly sized nook, then look no further! Some of the best man caves are created in what seems to be the most unusable spaces. All you need is space for a TV on the wall and enough seating for two or three blokes. If you’re lucky enough to have a basement or useable area under your house, know that this is the classic man cave location. Big enough to be set up like a full lounge room or a proper games room, basements provide a great separate area to the house to minimise disturbance to the rest of the family! You can even have your own private entrance for your mates to come and go, perfect for late night sports games! But more common in Australia are garages and sheds being converted into dens for the guys to hang out in together. A slap of paint, a power socket for a fridge and TV and a couple of couches is all you need to transform the shabbiest of spaces in to a gent’s paradise! What furniture do you need for a man cave? If you’re looking to deck out your man cave, keep your eyes peeled for cheap furniture! Considering the furniture may not be looked after in the same way as the rest of the house, it’s best to look for a bargain! Second hand furniture could be the best way to furnish the room if you think its going to have beer and chips spilt all over it anyway. It’s also safe to say that most men won’t appreciate throw pillows or scented candles in the same way as a woman might so most furniture can be basic… as long as it’s functional and points towards the TV! Man cave cabinets are also a must-have for display and storage! Collectable items such as figurines, DVDs, books and other memorabilia need to be proudly on display and enjoyed by all guests. Even alcohol bottles, gaming consoles, tools or sports gear needs to be stored so cabinets are the space saving and organised answer! What kind of décor is good for a man cave? Just like the rest of your house, the décor for a masculine space can be tailored to each man’s taste. Some like a rustic theme with hunting trophies mounted on the wall and other like a minimalist approach. But as we said before, candles and cushions are probably not going to be the choice of decoration! A good place to start is with what pictures to hang on the wall. Signed memorabilia specific to the cave dweller’s interest is a great way to make the room feel more personal. Whether it’s a music artist, sports star or a movie poster signed by an admired actor, memorabilia is often a cool and funky way to bring colour and personality to the space! Artwork of cars, cartoon characters, or funny quotes and signs are also good ways to bring some laughter and joy to the humble abode for the dudes! It can also be a place to show off by displaying trophies and awards won by the man of the house. What are great gift ideas for a man cave owner? There are so many cool items for a bloke’s games room that would make great birthday and Christmas presents! Instruments and car parts can be mounted to the walls for some eye-catching art. But dart boards, bottle openers and beer glasses and decanters are functional, fun and aesthetically pleasing! If you really want to treat the male in your life then something like an arcade machine, pinball machine or even just a foosball table would be the supreme addition to his territory. He can one-up his mates during the games and have a man cave they would all be jealous of. If you’re going to have a dedicated space for the fellows, then it’s got to be one worthy of showing off! Any gift to help mark his territory is one that will be cherished. We have loads of awesome gift ideas on our website, so grab a beer, settle in and have a browse. You’re guaranteed to be inspired! Don’t be a caveman, create a man cave! Sign up and every time we have a cool memorabilia, art or any other awesome auction you’ll be first to be alerted!